Ever since Gracie started school, I was excited to help her make a Valentine Box for her classmates to drop in their cute little Valentine cards. I didn't realize that her classes didn't make Valentine boxes for Kindergarten or First Grade. I was bummed. 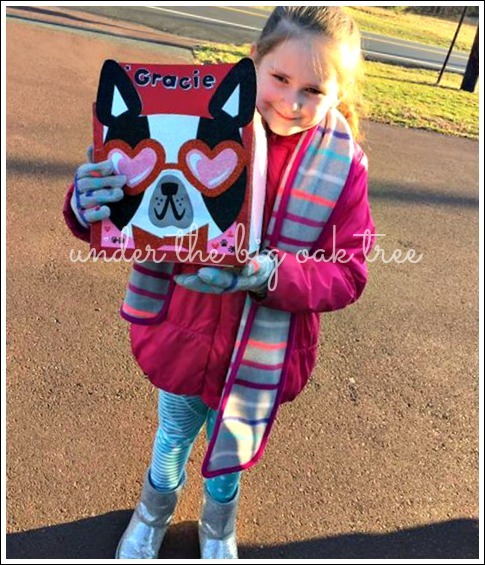 I cannot even begin to describe how happy I was that Grace and I could work on designing a Valentine Box for her to take in to her 2nd grade classroom. 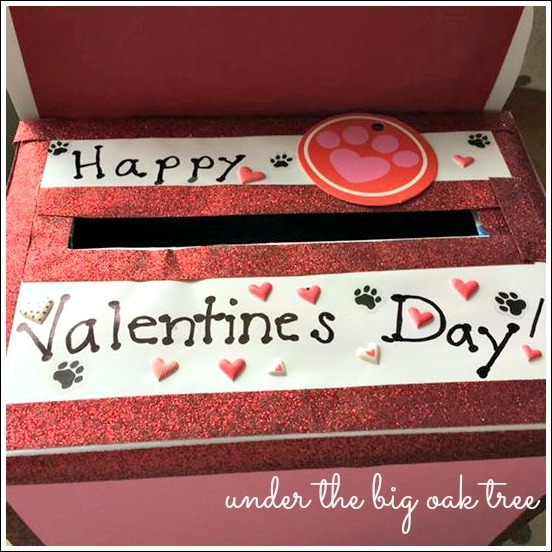 One afternoon, last week, Grace and I sat down and browsed Pinterest for some cute Valentine Box ideas. 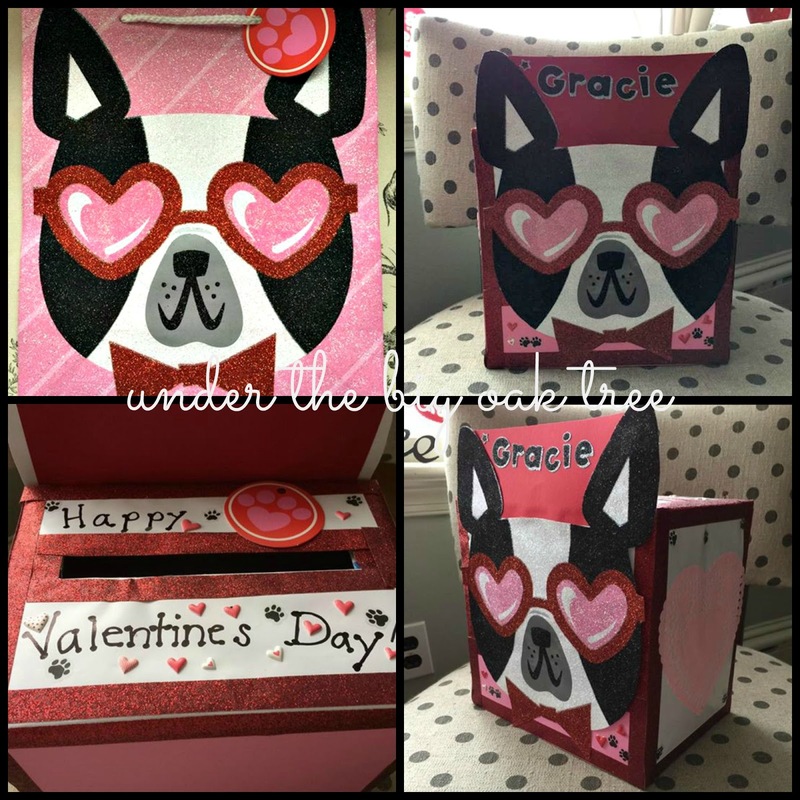 We saw lots of creative boxes and Grace decided she wanted us to create a Boston Terrier Valentine Box. Since, you know, we're obsessed with Boston Terriers. 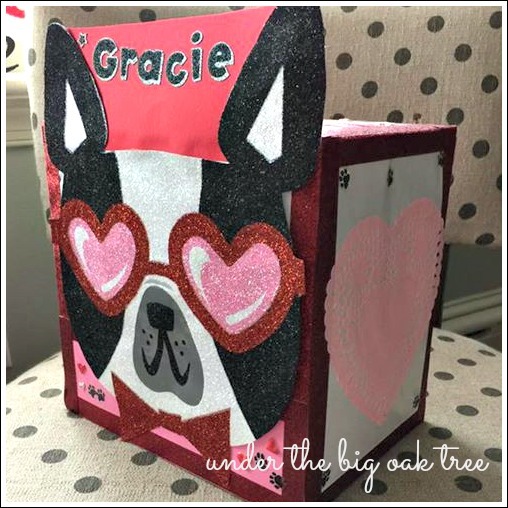 I'll admit, I was really proud that Gracie chose our favorite breed as the theme, but I was a bit nervous about designing a Boston Terrier Valentine box. I really didn't have any idea on how I was going to go about putting that together. We started by choosing a box that fit into the size specifications given by her teacher. After that, the only idea I had was to cover the box with wrapping paper. I figured either black or white paper would work. 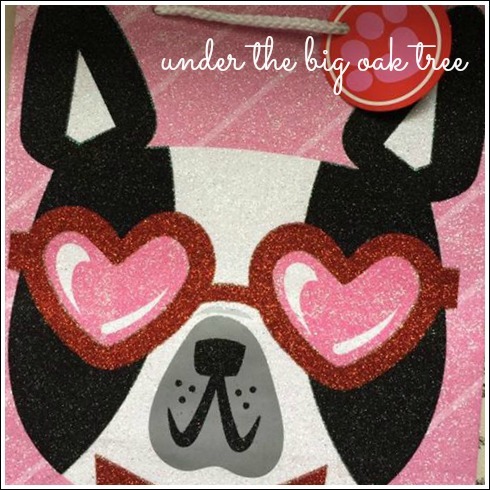 I stopped at Dollar Tree to see if they had plain white or black paper and I was thrilled when I saw a super-glittery Boston Terrier gift bag! I suspected it might be the perfect size to cover her box, so I grabbed three! Just in case we messed up and needed a spare! So after gathering our supplies, Grace and I got to work on assembling her box. We were both very pleased with how it turned out. The only thing we didn't do, was make a trap door for removing her Valentines either at her social at school or after she comes home. We did make the slot a bit on the big side, so Grace should be able to slip her hand inside and get her cards out. I'll have to remind her to reach in carefully so not to ruin the box, since I have a feeling she will want to add this to our Valentine decor for years to come! What a great idea! I love the color scheme, and it looks like it was a lot of fun to make. Thanks for sharing with us at Funtastic Friday.